True – but the wait weighs heavily now. make violent signs of little worth. and traffic jams to show. perhaps, we will say it was worth the wait. none of our roadblocks will stand. lighting the face of the dusty sky. of tarmac where the plane lost flight. no dust be lost today. Deciduous reminder to let go. find ways to cities, and ways away. 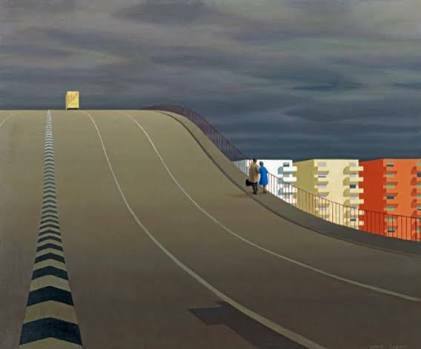 I more or less should be: a road. in all my circling I forget. 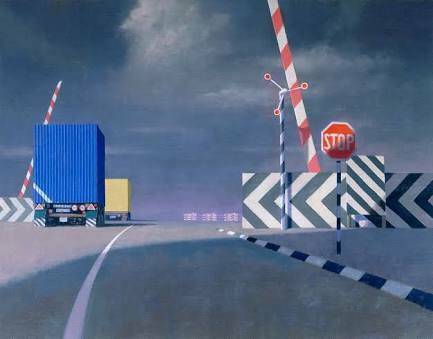 Jeffrey Smart, "Approach to a City"
And the smell of Vegemite hangs in the air. These scattered signs that put the fear to flight. We have been in need; we have been held safe. That we are weak, are strangers to this day. Of anguish lurking at the silent light? As we seek love, reluctant, through the dawn. The common man is held at standstill now. Great the cost to take the Bridge instead. Growing only lines on furrowed brow. And long for streams where stress is washed away. Stuck in horrendous traffic on the way to work yesterday, I began to reflect on the irony that, as someone who spends most of my life talking about reading and writing, I have remarkably little time to read or write. This is what those thoughts generated.